Bilberry has been used for centuries for problems relating to circulation. Bilberry helps to strengthen capillary walls due to the presence of a group of bioflavonoids, called anthocyanosides, found in the plant. The anthocyanadins are of specific benefit to the health of the eyes, as they can protect the capillaries of the eyes from damage. Tompson's Bilberry 12000 60 Capsules is a rich source of antioxidants, assisting in decreasing the risk of cell damage attributed to free radicals. Free radicals have been implicated in the development and progression of cataracts and other eye conditions. 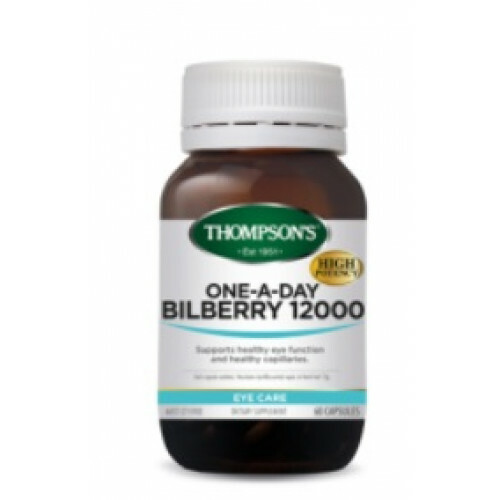 If taking medications check with your health professional before taking Bilberry. Not to be taken in pregnancy unless prescribed by a health practitioner. ♦ Product Description: Comvita® Bilberry Capsules provide your eyes with antioxidant and vasc..
♦ Product Description: Hi Well Premium Bilberry 27000+Lutein Premium Bilberry is formulat..
Go Healthy Go Bilberry 30,000mg contains lutein and bilberry and supports eye health. It is a p..
Pro-life Junior Bilberry Chews 240 Chewable Tablets!!! Bilberry, a relative of the blueberry,..
Blackmores Lutein Defence 45 Tablets is an antioxidant formula containing lutein and zeaxanthin that..
Supreme Health Advanced Vision Care 60 Capsules is an eye health formula with New Zealand Astaxanthi..
Supreme Health Advanced Immune Support 60 Capsules contains AstaNZ™ and it supports a healthy i.. Premium Bilberry 35000 Lutein 10mg 60 Capsules contains bilberry extracts 35000mg and Lutein 10..
Peter & John Bilberry 40000 + Lutein 25mg 60 Vege Capsules is a high superior formula designed t..